HubSpot is a great example of a career page that sticks to simplicity but answers all of the important questions in a compelling way. They cover their culture, teams, benefits, and a behind the scenes look, all on the main page. They break down the rest of their careers page into target group oriented chunks, like location, professional level, and department. Oh, and they even have a blog specifically dedicated to careers. Takeaway: Career pages don’t always have to be flashy. Simplicity can also work when done the correct way. Take a look at the career page here! Hotjar reveals a ton of vital information on their career page, including a detailed list of benefits, a description of the culture, and a breakdown of the interview process. These are all often details that candidates wonder about, but they usually are not able to access this kind of information. By answering these questions upfront, Hotjar eliminates candidates being misinformed or surprised during the process. Takeaway: Remember to provide relevant information to candidates so that they aren’t left in the dark about how your process works. Whether we are shopping on Amazon or looking for a new job, we love to read a constructive review. There's nothing quite as convincing as getting an opinion from someone who's actually been through that experience. That's why it's so crucial to include some employee testimonials on your career page, like Mister Spex does. They also highlight their benefits in a unique way underneath the testimonials and provide a very transparent view of their company to candidates. Takeaway: Including employee testimonials on your career page will help to build trust with potential applicants. Twitter does a great job of incorporating their own employer brand into their career page, alongside of giving candidates a feeling for what their company culture is like. The theme of their page is #lovewhereyouwork and they focus on why their employees love working for Twitter. They incorporate several twitter accounts from current employees and even link some tweets from company events. Takeaway: Try to incorporate your employer brand into your career page in a cohesive way. There are a lot of reasons to love Spotify’s career page. The page starts with a search function that allows candidates to filter by department and location. The language used throughout the page is very emotional, such as asking candidates, “What's your passion?”, inferring that passion is a key element of working at Spotify. They also do a great job of displaying their employer brand in the text and photos throughout the page. Takeaway: Think about the text on your career page, does it inspire candidates to want to apply? VOK DAMS is one of the leading agencies for events and live marketing. On their career page, they take the time to highlight their employer benefits in detail. Having this as a central focus of their page shows applicants that employee satisfaction is a top priority. The benefits section is a chance to really convince them why your company is superior to other companies and what makes you stand out from the rest. Takeaway: Don't forget to tell potential applicants what they will gain from joining your company. Every potential applicant is curious about who their future coworkers could be and if they will get along with them. On Kickstarter, this question can be answered even before an application is sent. Their career page gives you a detailed breakdown of all team members and their respective interests. Takeaway: Make sure to include a way for candidates to get to know their future team members on your career page. Starbucks uses the term partner rather than employee to show that they value and acknowledge their employees. Their career page starts with the words, “Be more than an employee. Be a partner”, and features a form that simply asks for the applicants name, which is then written across a Starbucks cup. 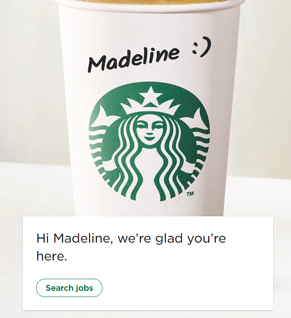 This is a quintessential piece of Starbucks employer branding and they tie it into their career page so well. Takeaway: A little personalization can go a long way in making the application process more memorable. Sometimes it's the littlest things that make the biggest difference. Ryte has certainly thought about everything that their potential applicants might want to see on their career site, but what stands out the most is their FAQ section. While it's not the flashiest aspect of their page, it covers those basic questions that candidates want answered. Takeaway: The more questions you answer ahead of time, the more prepared your applicants will feel. Ok, we're going to humble brag for a moment. We're pretty proud of our own career page, which we've put a lot of thought into. 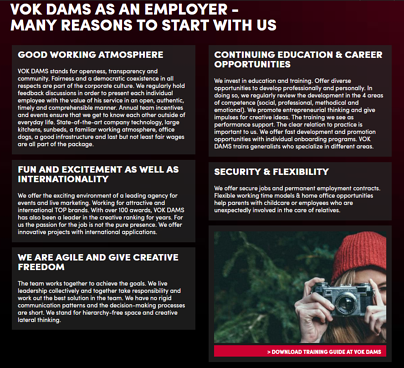 From an interactive timeline to highlighting our company culture, each section of our career page is designed to attract candidates attention. One thing that's really important to us is our talent pool, which is why we have a dedicated landing page for this topic. On this page, we give an inside look into our daily life, through photos of our team events and office interactions, a description of our office, and employee testimonials. Takeaway: If you have a talent pool, make sure there is a sign-up form or link to a separate landing page on your career page. Take a look at our career page here!